News: Regional News; Lincolnshire - South Family Day & Car show at Woodland Waters. Regional News; Lincolnshire - South Family Day & Car show at Woodland Waters. Woodland Waters, Ancaster provided a beautiful setting for our club's family day and car show. 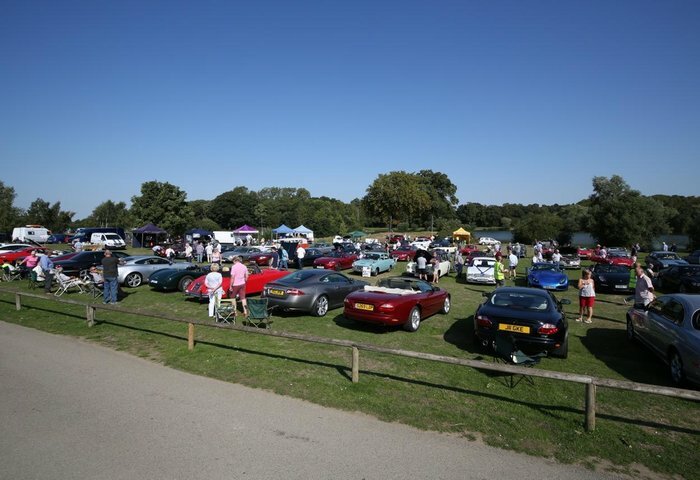 At its peak we had over 100 cars of all marques and ages beautifully lined up in the field adjoining the lake. 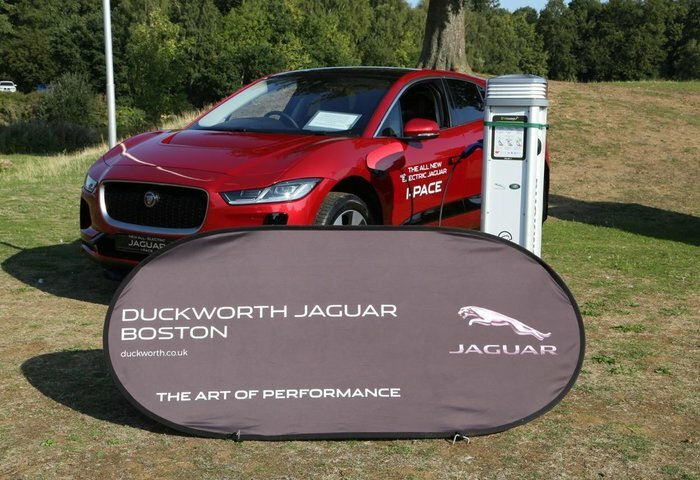 Local Jaguar dealership, Duckworths proudly showed us the very latest vehicle in the Jaguar line up, and allowed us to get up close to the all-electric iPace. John did not tire of the constant flow of questions, such as when can I have one, and how long is the extension lead? 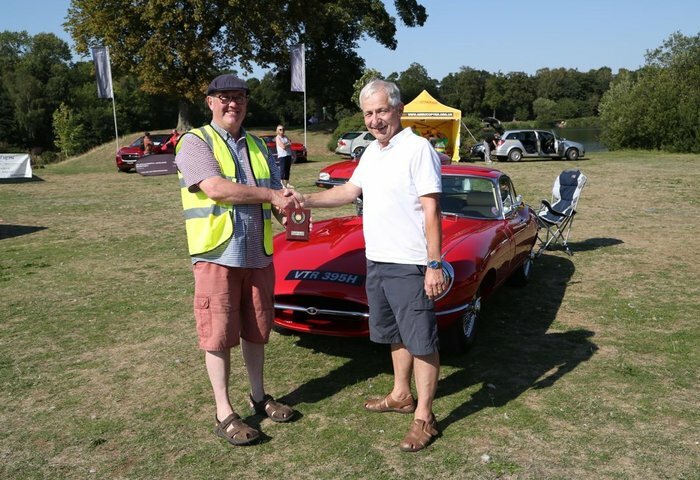 The prize for the "Best Jaguar" unanimously went to John Holmesfield from Cropwell Bishop, Nottingham for his beautifully turned out red 1969 Series 2, eType, FHC. 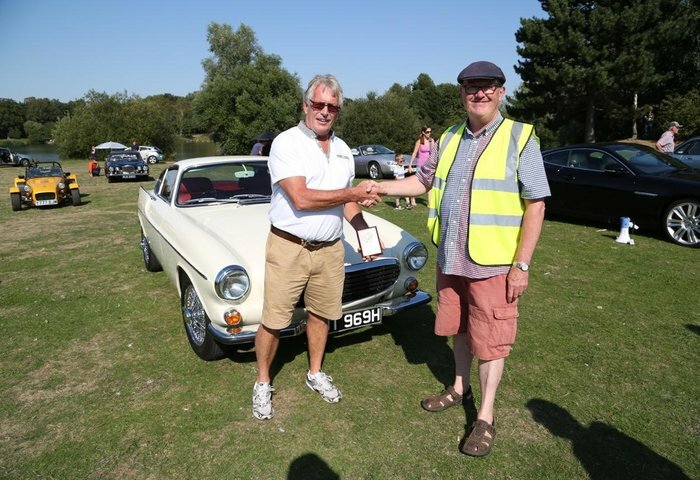 The "Best in Show" award proved to be very difficult to judge as we had so many glorious cars to choose from, but eventually it was agreed that Chris Shaw (also from Nottingham) and his 1970 Volvo P1800 was a worthy winner, and very evocative of the days of "The Saint" and Simon Templar. The winner of the raffle was David Thacker who took away a picnic hamper stuffed with goodies. Crowds gathered around the JEC's F Type raffle car, all hoping that their £2 investment would be the winning ticket. However we all are just going to have to wait. The day was finished off perfectly by a flypast from the BBMF Hurricane, a wonderful sight and sound that continues to make spines tingle. Thank you again to everyone who helped make this day such a great success.